Bristol Show: ELAC unveils Air-X active wireless speakers | What Hi-Fi? ELAC has launched a pair of active wireless speakers at the Bristol Sound and Vision Show 2014. The Air-X 403 standmounters can be used over a traditional wired connection, or wirelessly through the Air-X BASE. This is a wireless box with analogue and digital inputs, which can transmit signals to up to three pairs of Air-X speakers. Analogue connections include a pair of RCA plugs and a 3.5mm minijack. You also get two inputs for optical and one for USB. 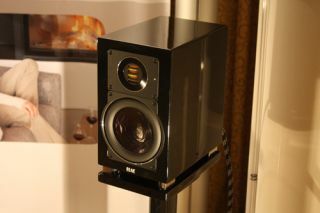 The speakers cost £2500, and the Air-X BASE is sold separately for £350. Both are available now. And if these don’t take your fancy, consider ELAC’s colourful Opalum panel wall speakers. If you want to get a better look at these, and the best of the rest from the Bristol Show, check out our video.